Least Action Principle: The sum of an action, between the initial state A, and its final state B, taken over a particular path must be at a minimum. That is to say, of all the paths between A and B, the path taken, without any interference, is an automatic minimum action, or a maximum amount of information, path. This means that the logic of the two end points is connected non-locally. Action defined, in Newtonian physics, as a quantity related to the momentum and position of a body. On the other hand, action (more specifically, action-at-a-distance-time) in quantum physics is related to a quantum observation. Leptons: Particles not involved with the strong nuclear force. There are six leptons in numbers: the electron, muon, tau, and their corresponding neutrinos. Li-Logic: Archetypal/gestalt logic or a pictorial hologram or a Mandala. Lorentz Transform: In the normal formulation of the Lorentz Transform, all velocities were assumed to be less than the velocity of light. With this assumption, the Lorentz Transforms are mathematical formulas that describe the increase of mass, shortening of length, and dilation of time characteristic of a moving body that forms the basis of Einstein’s special theory of relativity. In the Holon Theory, this less than light-velocity assumption was abandoned, and the Lorentz Transform formulas were used to derive the teleportation operators [ci]n in taking a body to a singularity at the moment of Now. M-Theory: M-Theory emerged as a unification of the five superstring theories, which is involved with eleven space-time dimensions. Magic: An ancient practice using knowledge that anticipated the ability for non-local influences. These are right brain intuitive non-local responses with very little or no learned knowledge of the intellectual type. Magnetic Charge: A magnetic-GUT dipole/monopole charge. While the proton is the charge particle for the electric dipole, the magnetic-GUT dipole/monopole charge particle is assumed to be the neutron. Magnetic Current: Communication between a magnetic-GUT dipole/monopole. While the electron is the current particle for the electric dipole, the current particle for the magnetic-GUT dipole/monopole is assumed to be the anti-neutrino. Matter: Matter, in the Holon Theory, is modeled using a Holon, as shown below. These are the three components for the essences of matter. The activities Holon for matter is stated below. The above mappings also indicate the nature of non-local entanglements and correspondences between inanimate and animate matters or between intentions and non-local connections. Anti-Matter: Imagine an elementary particle cut out from a sheet of pre space-time paper; if we consider the elementary particle as matter, the hole it leaves on the sheet is anti-matter (or vice versa). Thus, at God’s Creation, Creating the logic of matter, also Created the logic of anti-matter in a lock-key relation. The lock is two sided. It can be opened from the left side or right side. The keys are complimentary to each other. That is, their logic is in symmetry. Maxwell’s Demon: A hypothetical being that directs the motion of molecules in a way so as to circumvent the Second Law of Thermodynamics. In the Holon Theory this hypothetical being is taken to be the logic component of matter. Momentum: A change in position. Since information can be interpreted as changes, i.e., any change in state contains information; therefore, momentum can be viewed as mechanical information. Force: Time rate of change in momentum, or mechanical information. Newtonian Physics: Physics of the Least Action Principle, applied to the logic of mechanical bodies, (See Least Action Principle). In the Holon Theory, due to the fact that momentum can be interpreted as mechanical information and acceleration as a time rate of change in mechanical information, Newtonian physics can also be interpreted as the physics of information. Quantum Physics: In the context of information, quantum physics is the physics of observations at the moment of Now. (See Quantum Models in Volume 4) It is the physics of intention in a soul-spirit, or a spacetime-nonlocal, medium. On the other hand, Newtonian physics involves the mechanical activities of 3-dimensional objects actualized or Co-Created by the observation process. Non-Local Reality: A spaceless and timeless universe containing the medium for encoded logic. The reality of this universe is hidden in its encoded logic-information aspect waiting to be decoded by an observer. This decoding occurs by actualizing the spirit-knowingness or by actualizing the logic aspect of matter. Notice, 10 and 100 are both equal to 1 in base 9 arithmetic. There is no zero in base 9. Numbers & The Greek Alphabets: The Greek letters were 24, and the required number, 27, was made up by using Stigma for 6, Koppe for 90, and Sampsi for 900. Notice, there are also 27 coordinates in the I-Ching, namely, 12 terrestrial branches, 10 celestial stems, and the 5 elements. Fractional/Transcendental Numbers: As stated above, qualitative logic operates in the set of base 9 integers. What is the qualitative meaning in each of these 9 integer numbers when it is a transcendental number or appears as a fraction such as .5 or .8? Fractional numbers are formed, from the qualitative perspective, in the resonant mappings between base 9 and base 10. Included in this resonance is the mapping between numbers and geometry, for example, the Pythagorean Theorem. This action has to do with converting the logic encoded in these integers to information, which is an action dependent on the informed knowledge of the observer. There is also an upper bond in the observer’s informed knowledge. These upper bonds form the transcendental numbers and the fractals that form our physical world. The mappings and their actions are expressed in the Holon shown below. Numerology: Arithmetical operation in base 9 mathematics. For example, 15 is reduced to a number less than or equal to 9, thus, 15 is mapped into 1 + 5 = 6. Thus, the number 15 is equivalent to the number 6 in a base 9 system of mathematics. These 9 numbers, from 1 to and including 9, represent 9 information dimensions. 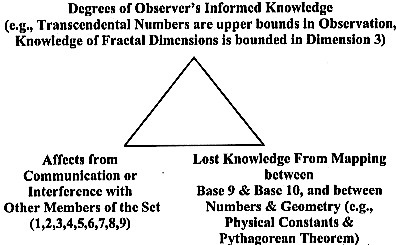 There exists a correspondence between any set of encoded information and this set of 9 information dimensions. Notice, within these information dimensions, the number 6 is different from the number 15. That is, although number 15 carries the information encoded in dimension number 6, embedded in this dimension is the information of 1 and 5, which represent the unique “makeup” of number 6. Most important is the make-up of the number 9. Thus, there are significant differences between 9 by itself, or 9 from the number 27, or 9 from the number 36, or 9 from the number 72. This orbifold space consists of a torus with three special, singular points. Like the torus, it is a two-dimensional surface in a three-dimensional space. By combining three such orbifolds together, it is possible to generate a six-dimensional space with 3 x 3 x 3 = 27 singular points. Such orbifolds are used in string theory to represent the space generated when the original ten-dimensional space compactifies. …What is the relationship of this patched-up orbifold to a Calabi-Yau space? It turns out that the Calabi-Yau space is a sort of smooth version of the repaired orbifold — it could be thought of as what happens when the radius of each of the twenty-seven patches shrinks to zero. Parallel Universes: In the Holon Theory, an evolution-involution model of the universe is adopted. Thus, in this model, the universe goes through various stages of evolution. Also within each stage of evolution there are two involution states, a previous state and a future state. Thus, these two involutionary states and the one evolutionary stage form the model of a tri-state universe. Each evolutionary stage represents the universe’s state of Becoming, while each involutionary state corresponds to a state of Being for the universe. Notice that each stage of evolution is bracketed with a beginning state and an ending state, whereas, the state of involution occurs at the ending state of each stage of evolution, in a discrete jump. This discrete jump is a singularity, where ascension occurs, i.e., the discrete transition from one evolutionary stage to another evolutionary stage occurs. In this model, the universe’s states of Being, in progression, define the universe’s ascension direction. On the other hand, the evolutionary stages define the universe’s activities toward the next state of Being. The former set is referred to as stages while the latter set is call states. Numbers represents the stages and states with their corresponding personalities embedded in each of the tri-states. The personalities are represented by each of the numbers 1, 2, 3, 4, 5, 6, 8, and 9. For example, stage 5 contains the dominating personalities for numbers 4, 5, and 6, where 4 is in parallel with the previous tri-state universe of stage 3. In summary, within the perspective of this tri-universe model, the present stage of our Universe contains simultaneously three dominating personalities defined by their status of involution-evolution, namely, stages 4, 5, and 6. Our universe’s next stage of evolution is a stage-7 in the tri-state 6-7-8 universe, which co-exists with involutionary states 6- and 8. But before evolving into a stage-7 universe, one must first ascend into a state 6-universe, which is a singularity. Notice that the transition from stage 5 to stage 7 occurs simultaneously in our ascension to a state 6-universe. In short, at each transition or ascension, one jumps from the evolutionary stage of one tri-state universe to the evolutionary stage of the next tri-state universe. Furthermore, the tri-state universe of 0-1-2 is a basic Creation, i.e., the encoding of God’s Input Logic of the First Cause or the initial conditions of our Universe; whereas, the tri-state universe 8-9-0 contains our Universe’s final conditions. These final conditions are embedded in God’s Encoded Logic of the First Cause together with the final set of involutionary logic satisfied by us humans in our return to God’s Creation through Co-Creation. (See Technology, and Universe’s Origin). See Ascension and String Theories. Particle: A 3-dimensional energy-mass object. Phase Changes: A general change in state, e.g., from solid to liquid, or simply the momentum of the system. A process, which involves the release of encoded logic-information and the re-encoding of new logic-information. Planck Constant: A constant, 6.63 x 10-34 in mks units, that involves the symmetry break between logic and its information, that is between the logic encoded in the archetypal universe (or the Base 9 World) and the decoded information via a logic-observer. Planck Length: Equals 1.62 x 10-35 meters. Planck Time: Equals 5.34 x 10-44 sec after the Big Bang. This is taken to be the time corresponding to the moment of Now. Pre Heaven: The lock logic in an Archetypal universe (or the Base 9 World). This set of lock logic corresponds to the logic encoded in the Vacuum, or the space inside zero. Six Days of Creation: In the first three days, God Created the Pre-Heaven Logic, or the lock-logic, of the Universe. In the second three days, God Created the Post-Heaven logic, or the key-logic of the Universe. In the seventh day, God rested and let the lock logic and the key logic Co-Create our 3-dimensional Universe. Religion: Blind faith on an unknown (i.e., unknowable) personal God. An organizational system of practices based on a common belief system. Resonance: In physics, the selective response of an object or a system that vibrates in phase with an externally applied oscillatory force. Remember, in the Holon Theory information is encoded in, or carried by, phase coordinates. Thus, two objects or systems, that are in resonance correspond to an understandable transfer of information between them, i.e., a lock-key connection between their logic-information. This transfer in the form of resonance has a direct correspondence with the conservation of matter. The types of resonance in matter are shown below. Resonator: A structure for producing resonance. Acu-points and ancient architectures are information-energy resonators, (see Acu-Points, and Body). UFO’s and crop circles are resonance produced artifacts. Resonating structures satisfy the necessary conditions for Co-Creation, which is the ability to convert the logic-information component of matter into its corresponding wave-energy component. That is to say, Co-Creation requires the manifestation of matter, from its pre-determined logic component into its particle-mass component via a resonant wave-energy action in informed non-local logic. Thus, for Co-Creation, the sufficient condition calls for the ability to manifest the energy-mass component from the wave-information component, while the necessary condition is the conversion of the logic-information component into a wave-energy component. Wave-energy is the intermediate action, or the responsible resonating process, in Co-Creation. Thus, we need to combine the ancient’s understanding in constructing information-energy resonators with today’s understanding of constructing energy-mass resonators in elementary particle accelerators. This integration is equivalent to left-right brain informed integration. Light and sound are the most known resonating processes. They were used in ancient science and technology. This process forms a Holon with components corresponding to light, sound, and lattice vibration or matter-wave in various media. To understand light and its relationship to the Co-Creation process, or the logic-information to energy-mass resonant process, we need to bring back the logic formulation on the composition of light defined as a photon Holon. Resurrection: The standard religious meaning of resurrection is: the state of having risen from death. First resurrection is a state of ascension. Preparing for a state of 2nd resurrection corresponds to a restored state of Christ’s Spiritual Teaching, see Ascension and String Theories.